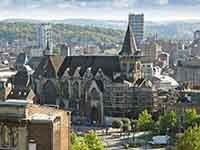 Liège is a city in Belgium, near the confluence of the Maas rivers, located at 90 km from Brussels. The population of the city is about 200000 people. In 1985, an IKEA store was opened here.